I love comfort food; there's no doubt about that. However, with making great comfort food, you find yourself either using old family recipes or trying out a bunch until you find the recipe that is perfectly comforting for you and your family. I love a good beef stew - always have, always will. My favorite "classic" comfort foods are typically stews, roasts with lots of carrots and potatoes, chicken and dumplings, pot pies, etc... In my opinion slow cooked and in lots of flavorful juices is one of the best ways to eat carrots as I'm normally not a huge fan (unless they're cooked in somekind of sweet, sugary substance but that kind of defeats the whole "eating veggies" thing!) Ever since I made this recipe from Williams-Sonoma I've loved it, however I decided to tweak it some to suit it more to what I wanted that night. There wasn't a lot of variation made, however those adaptations made me LOVE, LOVE this recipe. - S&P Beef to taste while heating 1 tbsp. vegetable oil in dutch oven over medium-high heat. Add half of the seasoned beef to the dutch oven and cook until brown, about 3-4 minutes, use tongs to rotate and continue browning on the other sides, about 3-5 minutes total. Transfer the cooked beef to a bowl and add 1 tbsp. oil, repeating beef cooking steps with remaining beef. - Reduce heat to medium and add last of the oil (1 tbsp.) Add onions, S&P and scrape up brown bits from the bottom of the pan. Cook about 5 minutes, or until onions are softened. Add garlic, stir and cook about another minute. - Stir in flour and cook about 2 minutes. Add in wine, scrape bottom of pan and cook until flour is dissolved. Add in beef stock and tomato sauce, stirring to completely incorporate. Add bay leaves and thyme to taste and simmer a minute or two. 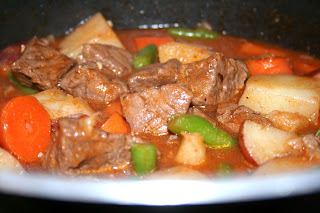 - Add beef, cut carrots and potatoes, stir tocombine, cover and simmer on low about 1 hour. About 10 minutes before planning to serve, add frozen greeen beans, combine and allow to heat through before serving. - Remove bay leaves before serving.